These stylish Wabi Sabi Design Poufs add a perfect finishing touch to any space with their understated elegance. Timeless, classic and completely unobtrusive, these beautiful Wabi Sabi Design Poufs reflect the principles of Japanese aesthetics and the acceptance of transience in home design. Wabi-Sabi is the most conspicuous and characteristic feature of traditional Japanese beauty and it occupies roughly the same position in the Japanese pantheon of aesthetic values as do the Greek ideals of beauty and perfection in the West. Developed in the 12th century, Wabi-Sabi advocates simplicity and humility, the rejection of all that is superfluous or artificial. These beautiful and timeless poufs carry the essence of Wabi Sabi design. These Wabi Sabi Design Poufs would be the perfect fit in any Axel Vervoordt styled interior, who's work has been built on the concept of Wabi-Sabi, see Axel Vervoordt: Wabi Inspirations available from Amazon.com. 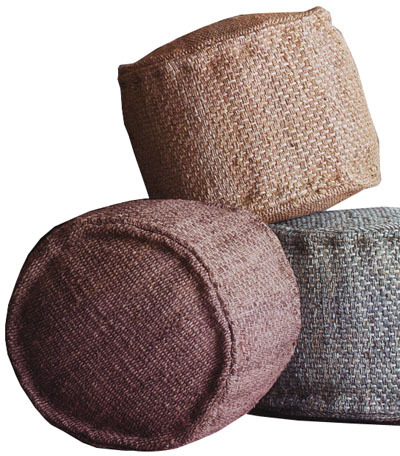 The Wabi Sabi Design Poufs are of high quality and are crafted by master artisans from tightly woven hemp and are filled with 100% pure wool. Available in three attractive color tones; orchid, natural or sky blue.